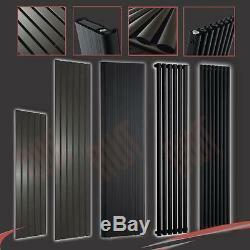 MIXED Vertical Black & Anthracite Central Heating Radiators, Oval & Flat Tubes. Electric Towel Rails (Rail + Element). Bidet Taps & Douche Kits. Shower Seats & Grab Rails. Black or Anthracite Powder Coating. Mild Steel or Aluminium - See Description. Includes Wall Mounting Kit, Bleed Valves & Blank Plugs. Our Range of Vertical Black & Anthracite Designer Radiators are ideal for a variety or roomsets where you want to make a feature of your heating installation. The robust powder coated dark finish fits seemlessly into an array of interiors and compliments a variety of other home furnishings. The Powder Coating is applied as a free-flowing, dry powder. The coating is applied electrostaticaly and is then cured under heat to allow it to flow and form a skin. The process is used to create a robust finish that is tougher than conventional paint. All of our radiators are manufactured using the latest technology methods. Each product is subject to a strict QA process throughout manufacture and packaging. Bar Pattern: Oval Tubes (50mm x 25mm) Pipe Centres: Width of Radiator plus Valves. 280mm(w) x1800mm(h) Brecon Black Output (t50): 2854 BTUs, 837 Watts. 420mm(w) x 1800mm(h) Brecon Black Output (t50): 3912 BTUs, 1147 Watts. 630mm(w) x 1800mm(h) Brecon Black Output (t50): 5008 BTUs, 1469 Watts. 280mm(w) x1800mm(h) Brecon Black (Double) Output (t50): 4112 BTUs, 1206 Watts. 420mm(w) x 1800mm(h) Brecon Black (Double) Output (t50): 7424 BTUs, 2117 Watts. 499mm(w) x 1800mm(h) Brecon Black & Anthrcite Output (t50): 3305 BTUs, 968 Watts. Bar Pattern: Flat Panels (60mm x 10mm) Pipe Centres: Width of Radiator plus Valves. 360mm(w) x 1250mm(h) Corwen Black Output (t50): 2080 BTUs, 609 Watts. 440mm(w) x 1250mm(h) Corwen Black Output (t50): 2870 BTUs, 870 Watts. 516mm(w) x 1250mm(h) Corwen Black Output (t50): 3719 BTUs, 1091 Watts. 360mm(w) x 1850mm(h) Corwen Black Output (t50): 3006 BTUs, 882 Watts. 440mm(w) x 1850mm(h) Corwen Black Output (t50): 3875 BTUs, 1136 Watts. 516mm(w) x 1850mm(h) Corwen Black Output (t50): 4914 BTUs, 1441 Watts. 610mm(w) x 1850mm(h) Corwen Mirror Black & Anthracite Output (t50): 4042 BTUs, 1186 Watts. Elias & Elias Maxi Vertical Anthracite Column Radiators. Bar Pattern: 50mm Modern Columns Pipe Centres: Width of Radiator plus Valves. 318mm(w) x 1800mm(h) Elias Anthracite Output (t50): 4420 BTUs, 1295 Watts. 437mm(w) x 1800mm(h) Elias Anthracite Output (t50): 6191 BTUs, 1814 Watts. 706mm(w) x 818mm(h) Elias Maxi Anthracite Output (t50): 3576 BTUs, 1048 Watts. 468mm(w) x 2018mm(h) Elias Maxi Anthracite Output (t50): 5020 BTUs, 1471 Watts. 587mm(w) x 2018mm(h) Elias Maxi Anthracite Output (t50): 6791 BTUs, 1990 Watts. Vesuvius Vertical Anthracite Aluminium Radiators. Bar Pattern: (Individual Extrusions) Pipe Centres: Width of Radiator plus Valves. 318mm(w) x 1800mm(h) Vesuvius Anthracite Output (t50): 4406 BTUs, 1291 Watts. 335mm(w) x 1800mm(h) Vesuvius Anthracite Output (t50): 5431 BTUs, 1592 Watts. Cariad Vertical Anthracite Aluminium Radiators. Bar Pattern: (Individual Extrusions + Rounded Edges) Pipe Centres: Width of Radiator plus Valves. 47mm(w) x 1800mm(h) Cariad Anthracite Output (t50): 5584 BTUs, 1638 Watts. 470mm(w) x 1800mm(h) Cariad Double Anthracite Output (t50): 7990 BTUs, 2343 Watts. 423mm(w) x 1800mm(h) Proteus Anthracite. Output (t50): 4549 BTUs, 1333 Watts. 444mm(w) x 1600mm(h) Bow Anthracite. Output (t50): 3016 BTUs, 884 Watts. 280mm(w) x 1600mm(h) Thor Anthracite (Aluminium). Output (t50): 2475 BTUs, 725 Watts. 465mm(w) x 1700mm(h) Newborough Mirror Anthracite (Aluminium). Output (t50): 4556 BTUs, 1335 Watts. Please note: Our range of designer radiators are supplied with fixing kit, blank plug and bleed valve but are NOT supplied with valves for connectiong to your central heating system. You will need a pair of angled valves or corner valves if your pipework is coming out from the wall or a pair of angled valves if your pipework is coming up from the floor. For our full range of valves please see our NWT Valve Multilisting. Scottish Highlands and Islands (Postcodes: AB, DD, FK, IV, KW, PA, PH). We are more than happy to deliver internationally. The item "MIXED Vertical Black & Anthracite Central Heating Radiators, Oval & Flat Tubes" is in sale since Monday, January 30, 2017. This item is in the category "Home, Furniture & DIY\Heating, Cooling & Air\Radiators".